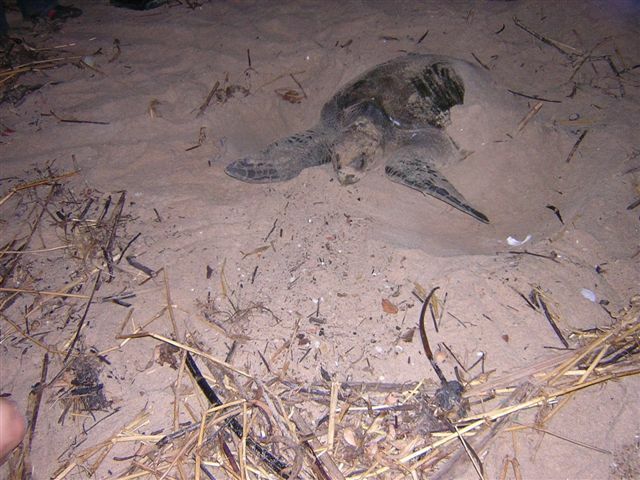 An Olive Ridley turtle preparing to lay her eggs at Praia das Oncas, Angola. The number of turtles nesting along the coast of Angola is declining especially the giant leatherback turtle. The Angola Field Group invites you to a presentation about the ‘Conservation Project to Protect Marine Turtles’, Thursday, April 30, at 8:00 PM at the Viking Club. Headed up by Biologist Michel Morais and a team of biology students from Agostinho Neto University, this project has been researching nesting activities of turtles on a beach south of Luanda since 2002, right after the war. Previous records of turtle research in the country date back to 1980. Come and join the University’s research team Thursday evening and learn all about Angola’s turtles! The presentation will be in English. Available now for the first time, the students will be selling high quality T-shirts with the turtle project logo before the presentation. Field Trip – Friday May 01 is a national holiday and we are planning a field trip through the Bengo River valley to Kaxicana, a small village on the banks of the Kwanza River, birthplace of the first president of Angola, Agostinho Neto. We are still waiting for approval but check this site on Monday for trip details and how to sign up for this trip. Everybody is welcome to attend the Turtle Presentation. Our presentations are offered in close cooperation with the Viking Club. Alcoholic and non-alcoholic beverages and snacks are sold at the bar, coupons must be purchased. The Viking Bar now opens at 7:30 PM! For sale, books about Angola, in English. If you would like to have a map showing the location of the Viking Club, please download it form our Join Us page. The Viking Club is on the main floor of the former Swedish Building at Rua Marien N”Guabi, No 118 in Maianga, across the street from the new Panela de Barra resteraunt. See you there!